I know this post's title is misleading. It makes you think that there's going to be something juicy or emotional in here, and I apologize for that, but bear with me. Maybe one day I'll blog about my social life (unlikely), but this is not that day. This is about another stressful and pressing issue - the fact that I am currently unemployed. Now, if you were to ask me how aliyah is going, I will always be positive. The move has been great, almost seamless. I love this city, my friends, my apartment. I have never felt more at home or more sure of any major decision I've ever made. The only dark cloud hovering over my perpetually sunny, aliyah day is the fact that I am a month and a half out of ulpan, and I haven't yet found gainful full-time employment. I am still enjoying the few hours a week that I assist the best event planner in Israel, but I need a job, my friends. A real life, full-time, paying- the- bills, up at seven, home after nightfall job. See, I have been working in some capacity or another since I'm twelve. I babysat, tutored, taught Hebrew school, and balanced books. I have been a counselor, a youth leader, and a madricha for almost every Jew in the tri-state area. And all of that was before I finished my Master's in Speech Pathology and worked in various schools all over Queens for the better part of seven years! This whole "not working" thing is kind of freaking me out. So you must all be wondering (and by all, I mean my mother and other assorted concerned adults) "Jordana, why don't you just continue to pursue speech therapy in Israel?" The answer to that is four-fold (as you can see, I've answered this a lot.) One, you have to take a qualifying exam in Hebrew to work here in an agency/school system. At this point, I don't think I could pass this exam in English, as it's been a million years since I graduated and I'm a bit fuzzy on oral musculature and sensorineural hearing loss these days. Second,on the crazy chance that I passed said exam, I'd then have to see clients, plan lessons, do paperwork and meet with parents in Hebrew! As proud as I am with my budding Hebrew skills, that's a truly daunting thought. Third, and I'm being honest, is that the pay here for speech therapy is okay, but certainly not good. I have a friend who works for a kupa (agency) who says she basically makes enough to cover her babysitter. I think most speech therapists in the US will tell you that the pay and the hours are a strong factor in choosing a career as an SLP. This is not really as much of a factor here. But I think the biggest reason for me is that, with all these barriers, if I really loved being a speech therapist, I'd do it here too. But I never did. When you choose a career path at eighteen, you have a certain life-plan in mind, one that includes a husband and kids in the near future and requires a nicely- paid, flexible job. So you choose speech and you work in it, and you enjoy it, but then your life isn't necessarily exactly what you envisioned. You don't need that family-life flexibility and pay as a single girl. Making aliyah was the fulfillment of several dreams. One was to live in the Jewish homeland and hopefully raise my own family here. Another was to find a job in an area in which I am passionate and talented, to feel a sense of fulfillment in my job. This is not to say I wasn't fulfilled helping kids learn to better communicate; it was just never my passion. It's just being honest about who I am as a person, and using my skills in a different way. For years, I worked on a volunteer basis in the worlds of Jewish and Israeli advocacy. I love meeting and working with Jews and Israel advocates and I knew by coming to Israel, that's where I saw my path leading. Okay, great! So now that I had a direction, how do I go about getting a job? I had a two-pronged system. One was what Israelis call protekzia, or connections. This is where I'd tap into the thousand people I know in the Jewish world, add that to the two thousand people my mom and dad know, the ten thousand my synagogue friends know, and the other various people I'd randomly meet though an awkward and unnatural phenomenon known as networking. As part of this plan, I was advised to join LinkedIn, a social media platform which is essentially putting your resume in a questionnaire format and then forging a "connection" with every human who looks vaguely familiar to you on the site. Apparently, they don't have to be your friends, just someone who's name you recognize next to their picture. I joined this website, and being the absolute Jewish- geography superstar that I am, got to connecting! "But now what?" I thought. I have sent my resume to every person I've ever met who possibly knows anyone in the Jewish organizational world, my dad is basically accosting everyone in shul about a job for me, and my million amazing connections in different organizations are coming up empty! What do I do? That is where the second prong comes in- good old fashion job searching and applying. When I was planning my move here, Nefesh B'Nefesh helped me a lot. Then, in December, they sent me an email asking how my job search was going at the wrong time. I responded with a strongly worded email saying, basically, "Not great, you gonna help me or what?" And guess what? They did! They sent me this great little dynamo, Melissa, who revamped my intensely outdated resume (eight years in speech, remember?) and showed me all the places I should be looking. She also, bless her, started sending out my resume herself to jobs she thought might be appropriate for me. As appreciative as I am for this, it sometimes leads me to interviews where I have literally no idea about the job for which I'm applying. "Ohhh, you're looking for a part-time office assistant? Okayyyy, cool." But I put on a brave face and try and get that office assistant job! Not that I want the job, I just want to get the job, you know? But this isn't the time to get into my competitiveness issues. 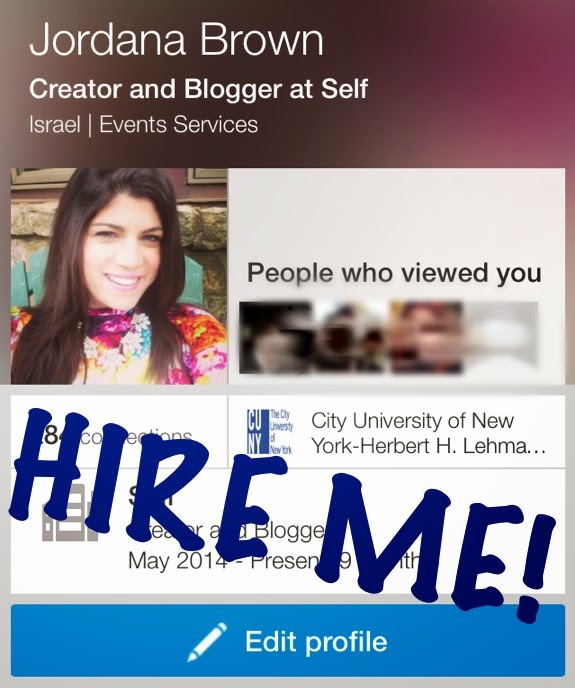 Moving on to interviewing in Israel. I know the job market here in this country. I am not in high-tech and I am not an engineer. I have not created an app, and I am not a radiologist in NYC who commutes back and forth. I am not a real-estate magnate and I do not own a sports team. I will never be wealthy in this country. That is not the goal. The goal is to make enough money to afford my rent, go out on Thursday nights with friends and maybe buy a ticket back to the States once a year. I'm a simple girl. But apparently, based on the current salary base in this country, I am aiming too high. Essentially, this is what you're dealing with (paraphrased): "Hello, Jordana! So great to meet you. Let me tell you what we're looking for here at ABC Organization. We're going to need you to direct our social media and digital marketing campaigns, take care of our English correspondence, plan our events, take care of all our logistics, produce our newsletter, maintain and grow our donor relationships, do some light office work, write and edit our website content...(10 minutes pass) and we're looking for Sunday-Thursday, 8AM to 5PM but obviously more when the need arises. Now the pay is going to be low, but it's such a great work environment and you will really get a lot out of this." Then they quote you a number so low that even if it were dollars you'd freak out for the sheer amount you need to accomplish to earn said salary, and your mouth is agape. And here is the kicker! You are one of ten applicants (at least!) for this job! There are nine other girls (I don't see many guys in the waiting areas with me) who are fine selling their lives to these organizations for peanuts. So you suddenly feel like you need this job, you must have this job! It is a stressful environment, especially for someone like me, who knows what they need to accomplish in life and how to do it, but has no way of actualizing it. Melissa from NBN said to me, "Finding a job is a full-time job," but I don't want this job! I want to make the lives of Jews better, I want to improve the lives of Israelis, I want to make a significant difference in this country I love with the people I love, and I am hitting the proverbial wall. So that's where I am, currently. I appreciate you taking the time to let me vent, and I hope I made you laugh a little. It's really not that dramatic, and most of the time, it' a great learning experience. And even with all the hassle, the financial stress and the dramatics, I wouldn't go back to a cushy life in NYC for the world. Israel is the only place I want to be, warts and all. To leave off on a positive note, I know this is temporary. It was a little nuts that my aliyah was going so smoothly, and I had to be aware that some bumps were bound to show up on the road. So I will keep sending out my resume, keep networking and keep interviewing. And hopefully, in the not-so-distant future, I will look back at this post and think "Wow, what a stressful time! Glad that's over!" Wish me luck, and if you want, connect with me on LinkedIn! Let's network!